When the majority of people speaks about watches, most of the time, the same brands are discussed. That’s not a coincidence, after all, these brands have either worked for years to build a heritage and a name, or they’ve just shocked the industry. A logical result of these things is the fact that people will talk about your brand. If that’s good or bad depends on the people who are talking. Anyhow, there are brands out there that have a relatively short history – you could almost say, no history at all. But since some smart pants decided everything that has already happened is history – technically these brands do have a history. Very difficult I know and not important at all, but I just wanted to mention it. One of these brands is Laurent Ferrier. If I could name one aspect of this brand that will definitely write history for them, it’s most definitely their cases. Good lord, have you ever seen such beautiful curves? 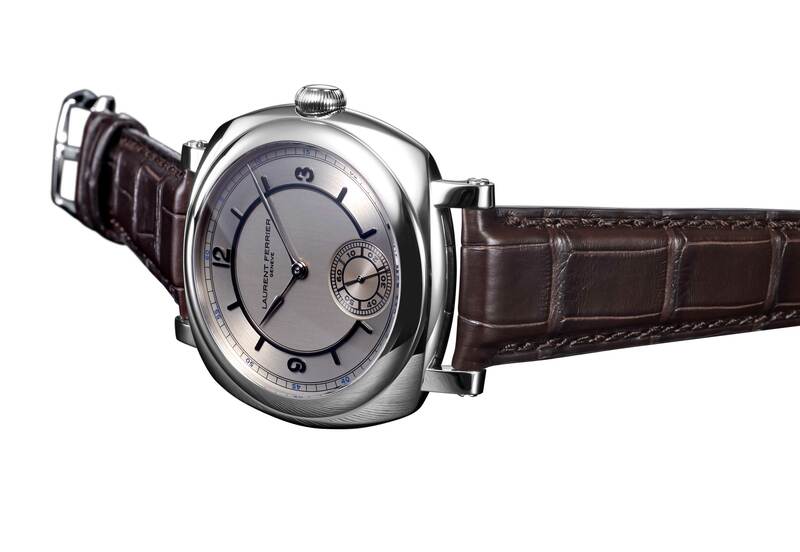 Laurent Ferrier is a brand started by – take a wild guess – yes, Mr. Laurent Ferrier 6 years ago in 2010. A typical idea that just needed to see the light of day. Mr. Ferrier wanted to create watches representing values that he thinks are important in a watch: simplicity, precision and pure, uncluttered beauty. Well, I have to admit, he succeeded very well in realizing watches that meet these values. I really like the watches he and his son Christian make. The latest addition to their collection of beauties is the ‘Galet Square Swiss Finetiming Limited Edition Vintage America I’. A mouth full, but I refer to it as Galet Square SFLE from now on. 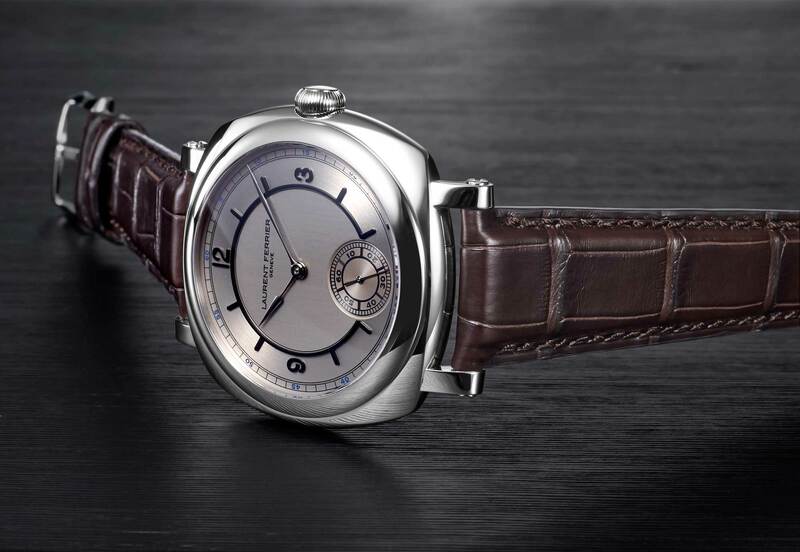 If you are familiar with the Laurent Ferrier collection, you will know that the Galet Square collection is the only collection with this characteristic case. The case could possibly be the most beautiful curved case I’ve seen in my young life. A nice statement made by my partner in crime Kees: ‘the curves and beautiful edges do remind me of a Jaguar E-type’. Now, if you’re a Jaguar fan or not, that can only be a compliment. There are a few things in life that are really mesmerizing and the Jaguar E-type and Laurent Ferrier Galet Square are amongst those things. This limited edition made for one of their exclusive retailers – Swiss Finetiming – is a truly astonishing piece. Made from a design point of view that respects the aesthetics known from the brand. The beating heart of this new Galet Square is a micro-rotor movement with ‘échappement naturel’. This steel beauty has a two-tone dial that’s typical for the 1930s and lugs that have been specially created for this limited edition. If you like it, you have to be faster than light, only 10 pieces will be made. No crazy additions, no weird shapes and no useless cool names and materials to make it transform into a robot or something. Just simple design, beauty and well-chosen quality materials. Laurent Ferrier is like that quiet classmate, the one you respect but don’t hear that often. You know, that boy that sits in the back, in normal clothes – clothes fit well though – and doesn’t bother anyone. If he speaks or shares his thoughts, it’s accepted and respected. That’s how I see Laurent Ferrier. Not here for his share of the pie, but for the realisation of his vision and passion. This Galet Square SFLE has a dial that – in the line of the brand – really attracts your attention. With an outer circle brushed in a different way than the inner part of the dial, the two-tone effect is really mesmerizing. On the outside, a circular brush effect is used, in contrast with the vertical brush effect in the middle. It’s these kind of details that wouldn’t catch your eye at first, but they are characteristic for the typical balanced design of a Laurent Ferrier timepiece. These two different surfaces are divided by a delicately raised chapter ring, a detail that fits perfectly in the whole design of the watch. Besides the fact that the indexes are nicely raised on the dial and the two different surfaces are well-balanced, the chapter ring perfectly harmonizes with the sub dial at 6. There are a lot of different details to this watch, and still, it has a very simple and elegant look. There’s nothing that really distracts your attention, everything fits like puzzle pieces. The sub dial has a very different surface than the rest of the watch and still it fits perfectly. The relief used to separate this seconds from the hours is made in such a way it displays the difference in value. Looking at the sub dial, I get the feeling that the seconds are the regulating machine behind the bigger picture. I know, it sounds kind of weird, but with a little bit of imagination you’ll understand what I mean. Furthermore, the case of the Galet Square is as rank and beautiful as ever, even with the change they made regarding the lugs. I think the difference between the lugs and the case is very obvious when it comes to shape, yet through polishing and placement they flow harmoniously into the case. 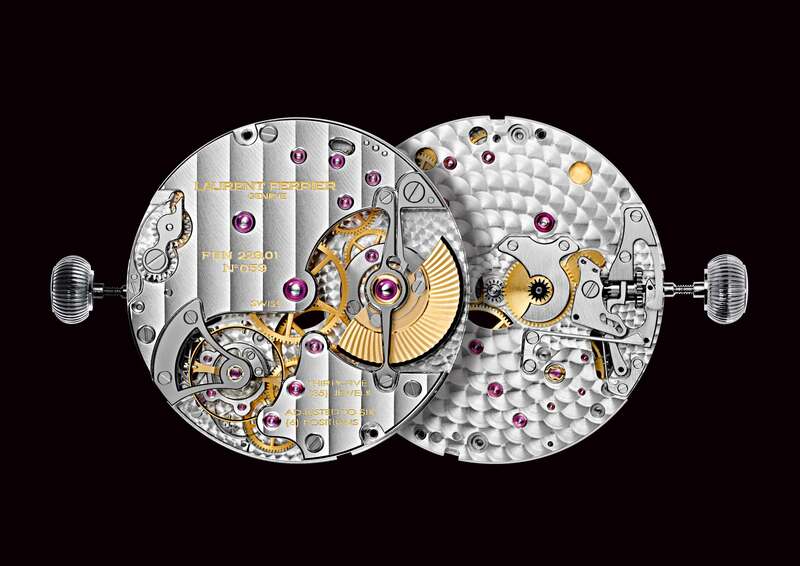 What I find interesting in particular is the fact that there are many different shapes involved in this watch. As I said my colleague compares it with a Jaguar E-type, I like to compare it with a pebble stone. At the heart, this watch is uses the third exclusive in-house produced Calibre; the FBN 229.01 Calibre. This is the third movement fully developed in the Laurent Ferrier workshops, not bad for a brand only 6 years of age. A cool innovation in this movement is the fact a silicon escapement is used, which has a double direct impulse on the balance. This system gives two impulses per oscillation and therefore requires two escape wheels and a specially designed lever. Besides that, the back sapphire is treated to show the Swiss Finetiming logo. All this beauty comes on an alligator leather strap stitched by hand that – yes, again – perfectly matches the watch. A watch like this, especially with these kind of lugs won’t show its true beauty when it’s placed on a stainless steel bracelet. A good decision, for a good watch. At the one hand I regret that this timepiece will only see the light of day 10 times, but for a well-balanced beauty like this, maybe that’s better. 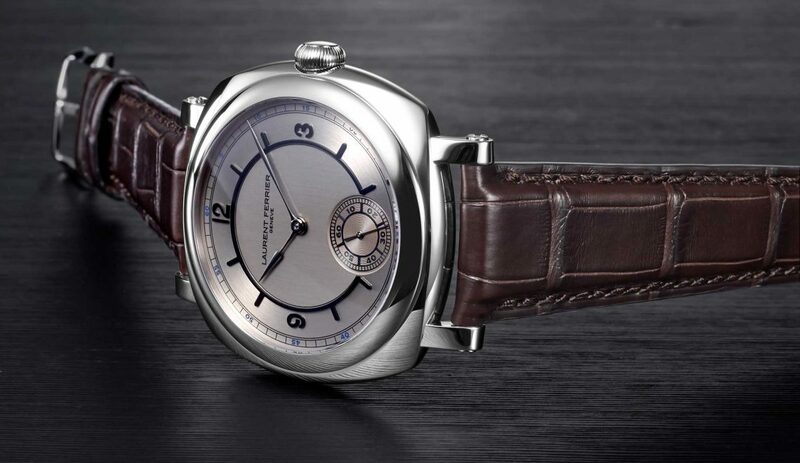 A round of applause for Laurent Ferrier and Swiss Finetiming for this watch. My likes are on their side.